If you are bringing a telescope, please arrive before dark, as it is much easier to set up equipment when it is still light. 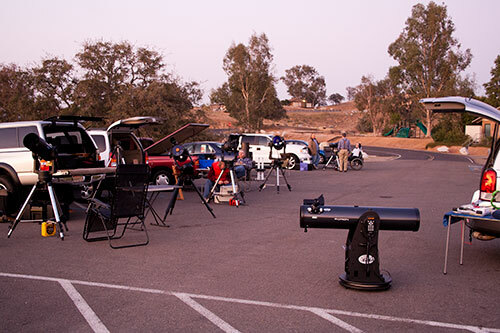 If you come to a star party without a telescope, please park in an area of the parking lot away from telescopes. This makes it easier to leave without disturbing the night vision of those who are still observing. Don't use white light in the observing area. Dim red light is preferred, as it preserves night vision. Make sure your car (interior and exterior lights) follows this rule as well. If you must use white light for a moment, shout out a warning. Never touch anyone's equipment without permission, but don't be afraid to ask. Never touch any glass optical surface. Stargazing is a quiet, peaceful activity. Please avoid loud and boisterous behavior and loud music. If you bring children, please keep them with you and ensure they follow the rules. Watch your step! Some telescope equipment requires power cords and computer cables; there may be wires on the ground. If you are a smoker, please stay downwind of the telescopes.